Lindt has a tasty chocolate bar offer! Get a $3 off coupon on your next Lindt Excellence product when you purchase two Lindt Excellent bars! 1. Buy 3 Lindt Excellence 100g bars in one transaction between April 20 and June 15, 2017. 2. Text or email a picture of your receipt to offer@​everyday​excellence​offer.com or upload it online at Everyday​Excellence​Offer.com on or before June 25, 2017. 3. 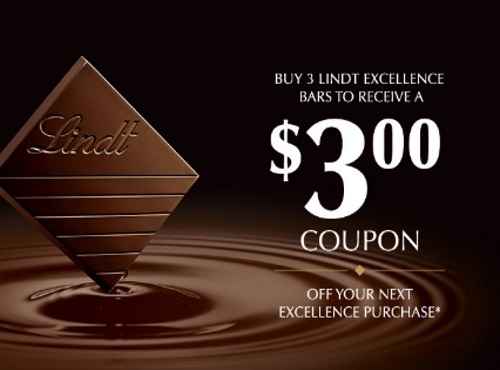 Receive a coupon for $3 off your next Lindt Excellence purchase. One coupon per valid receipt. $3.00 off purchase of one (1) Lindt Excellence (100g) bar at Canadian retailers only. Consumer is responsible for any remaining balance if purchase price exceeds the coupon value. Limit one (1) coupon per transaction, no cash value. Cannot be combined with any other offer. Coupon can also be redeemed at Lindt Retail Outlets. No facsimiles. Coupon expires on September 30th, 2017.